I just got this CD this week and let me tell you, it is one fascinating show. Six months ago no one knew this recording even existed, now here we are with a terrific package from the new label Madison. They should have named this one "Breathing Out Fire!" (Click here for the actual Breathing Out Fire CD). I hope this release just pisses the hell out of certain people, the ones who like to say "I've got this and nobody else does!" Particularly a certain individual in Chicago, IL who said there are no recordings from the Astrodome. Well, here's one from 1974, and I've seen the tape box from one in February 1970, so maybe that one will surface too. No matter how smart you think you are, there is always somebody smarter. Thus ended the lesson. This CD is the afternoon show on March 3, 1974 at the monstrous Houston Astrodome. As in the shows from February 1970, Elvis did not use an orchestra, just rhythm section and backup singers. 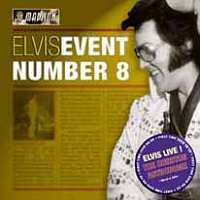 In addition, there apparently were no warm-up acts, just a sequence of events/acts, and when it was Elvis' turn, bam! Away we go! The show had to have started with a drum roll, but the recording starts while the band is playing the opening riff for 'See See Rider' and apparently Elvis is already on stage, as he starts singing about 8 seconds into it. This is a good version as Elvis is really putting forth an effort. His voice distorts just a little from time to time as his mike did not have a wind block, that or level is just a tad high. After this opening number, Elvis says "...good evening ladies and gentlemen. I'm event number 8!" He then quickly jumps into 'I Got A Woman' and this is a very good version too. His performance on these two songs remind me somewhat of some of his concerts in 1976 in that he is almost trying to vocalize the lyrics too much. He may have been nervous in front of a crowd that size, or because the crowd was so far away he felt he needed to do more. Next is 'Love Me' and this is one of his better efforts on the song as he sings it without fooling with the audience (they were way out of reach anyway). 'Trying To Get To You' follows and this is a very nice take. Then comes 'All Shook Up' & 'Love Me Tender', which are both well done. 'Johnny B. Goode' follows and it is awesome! Elvis and James Burton just go to town on this one. 'Hound Dog' & 'Fever' are next and Elvis is puts forth some extra effort on both of these numbers. Now we're gonna get serious. 'Polk Salad Annie' has to be a killer. Elvis puts so much effort into the doing the wild thing at the end that he can hardly talk. He barely says a couple of words in between each breath. The first time I listened to the CD, I thought it sounded like he was going to pass out. He asks J. D. & the Stamps to sing 'Why Me Lord' and I was very surprised that he joined in on the first chorus. This song is well done, and J. D.'s voice sounds terrific in the dome. 'Suspicious Minds' is next, and Elvis lights this one up, too. He does four straight verses on the second half and since he only had to "work" the 5 second drum roll at the end of each verse, he doesn't get as winded. Next are the band introductions, and then immediately it's back to work. A nice version of 'Can't Stop Loving You' starts the second half of the show, and then Elvis introduces his new song 'Help Me'. It's a very nice performance and then Elvis announces 'How Great Thou Art'. Even without the orchestra, this song sounds wonderful. Olivia Newton John's 1973 Grammy winner 'Let Me Be There' is next and Elvis does an excellent job with this song. Elvis always thought it was a great song, but some critics like that jackass Robert Hilborne of the Los Angeles Times, thought it was a waste for Elvis to sing a song like that. 'Funny How Time Slips Away' is pretty much as usual and then Elvis sincerely thanks the crowd for driving out to see him. Nobody remembers the long lines at the gas pump in a city the size of Houston, or only being able to buy gas on odd or even days depending on the last number of your auto tag. Not to mention the time it takes to get in and out of the parking lot at a place like the Astrodome. I believe he was very touched that so many people came, as the afternoon crowd was bigger that any from the 1970 shows. The evening show would be bigger still, with over 44,000 people in attendance. 'Can't Help Falling In Love' brings the show to a close and then Elvis is driven around the crowd for about three minutes as the band plays a neat variation of the opening instrumental riff. This is a must have CD. Do whatever you have to do (beg, borrow, or steal) to get a copy. The packaging is first rate, with a nice booklet featuring several pictures from the evening show (apparently no suitable pics from the afternoon gig were available) and some interesting liner notes. The sound is fantastic, especially considering it where it was recorded. There is no echo, and you can hear the guitars, bass, piano, and drums perfectly. Get one while you can. You'll be sorry if you don't. First, this is a fantastic CD! I will go song by song on this review. This is a very rare show, because there was no orchestra. So most of the songs sound like studio takes. Also for a huge place it sounds like there are only two or three people there. The only clapping you here is by the Sweets and the Stamps. 'See See Rider' - this is a good version of this song, but not the best. 'I Got A Woman' - Elvis starts off with his usual, "well well well." This is a very good version! It almost sounds like the one from "As Recorded Live On Stage In Memphis". Which one is the best? 'Love Me' - this song is not one of his best songs anyway. I think it is Poorly done on this CD. There are better versions out there. 'Trying To Get To You' - this is one of the best songs on this CD. It sounds great. His voice sounds great on the version. 'All Shook Up' - not the best version, but still a very good one. It is a little slower than we are used to from 1974. 'Love Me Tender' - first he tells everyone that he is going to sing a song from his first movie. Just a little he says, and he meant it this song is only 1min and 18sec. Not a great version. Poorly done! 'Johnny Be Goode' - a very good version. You can really here James Burton giving it his all on this song. Elvis gets the words right on this version, which is rare for 1974. 'Hound Dog' - very very poor. I wonder if Elvis ever sang this song right after 1970. 'Fever' - an ok version. It sound likes the one on Breathing Out Fire. 'Polk Salad Annie' - a very rockin' version! 'Why Me Lord?' - this is yet another great version. I don't think I have ever heard a bad version of any song the Stamps and J. D. ever sang. 'I Can't Stop Loving You' - Elvis say to the crowd that there is one thing he can't stop doing. And he breaks into the song. A very good version of the song. Sounds a little bit like the "Hawaii"-version (1973). 'Help Me' - the best song of the whole show. It sounds exactly like the studio version. It is truly great!!! Worth the price of the CD alone. 'How Great Thou Art' - a very good version. Sound like his Grammy winning version from Memphis (March 20 1974). However, I think that he sang this song best in 1977. 'Let Me Be There' - I really don't care for this song. But this is a good version. It has a reprise, which is very good. 'Funny How Time Slips Away' - this is also a very good version of this song. Sounds like the Madison Square Garden versions. Not to fast. 'Can't Help Falling In Love' - yet another poor version of this song. But he sings it because it is a song the crowd loves. Over all this is a very good CD. The cover art is great. So is the material. Another great CD by Madison! Review by - Cory Fitzharris - U.S.A.